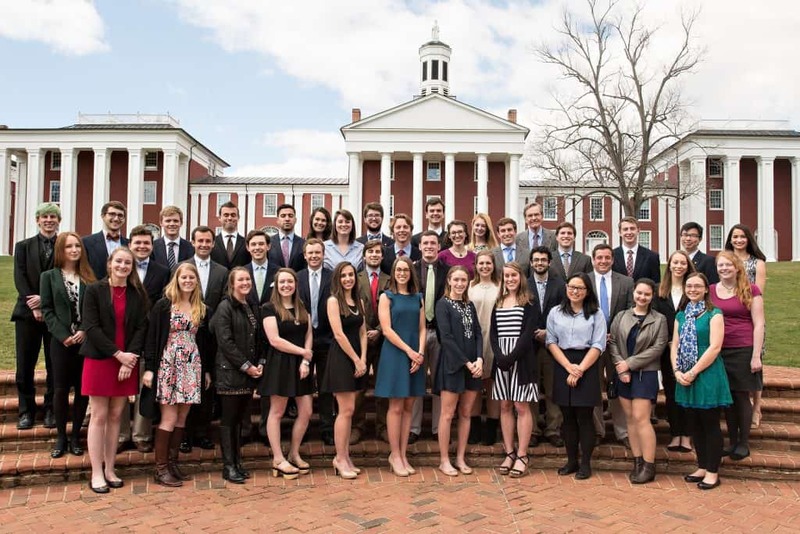 The Phi Beta Kappa chapter at Washington and Lee University welcomed 49 members of the junior and senior classes and seven graduates from the Class of 2016 into the prestigious honor society at the Phi Beta Kappa/Society of the Cincinnati Convocation on Sunday, March 19. All of the inductees were accepted into Phi Beta Kappa based on their exceptional academic achievements. The chapter inducted as an honorary member Roger Jeans, Elizabeth Lewis Otey Professor of History Emeritus at W&L, in recognition of his longstanding commitment to scholarship and publication. The chapter gave Henry C. Patrick III and Kathryn K. Osowski the Phi Beta Kappa J. Brown Goehring Sophomore Award, which goes to the student(s) with the highest cumulative scholastic average through the end of the fall term of his or her sophomore year. The award honors J. Brown Goehring, a retired W&L professor of chemistry who, during his 38-year career at W&L, spent 22 years as secretary/treasurer of the University’s Phi Beta Kappa chapter.